By amelioration (improvement) is meant a purposeful change of mean annual temperature, structure and properties of frozen, freezing and thawing ground and of the thermal-moisture regime in the direction required for solving the particular practical problems. Thermal, water-thermal, mechanical, physical-chemical and chemical amelioration is used. Thermal amelioration consists of the artificial lowering or raising of ground temperature using various heat sources. Heat transfer is performed in ground by conduction. In water-thermal amelioration the heat transferred by convection and conduction in the course of water injection, percolation or irrigation is used. Mechanical methods of amelioration are used for changing the ground properties and include: ground substitution, consolidation, deconsolidation, drainage, etc. Physical-chemical and chemical amelioration modes consist either of using the heat being released or absorbed in the course of chemical reactions or in changing the state of aggregation of the soil by injecting various chemical reactants and by using the electroosmosis effect. Methods of thermal and water-thermal ground amelioration involving artificial change in the permafrost temperature, freezing of thawed ground and thawing of frozen ground before or during construction have received the widest acceptance. This is carried out in various ways. Methods using natural cooling (systematic snow removal in winter, shading and protection of ground surface using heat-insulating material in summer, construction of ventilated cellars, piles allowing natural ventilation into the foundation structure in the cold period, etc.) are examples. The advisability of using one or another method is shown by thermal engineering calculations. To accelerate the process, the artificial cooling is effected by pumping air into boreholes driven through the whole thickness of the zone being cooled or into freezing pipes, with special air-supplying installations, sunk into these boreholes (Fig. 18.5). Heat removal from such a pipe ranges from 130-140W m"2 according to S.M. Filipovskiy's data. Cooling (freezing) depth is as much as 17-20m. The drawback of this method is the necessity for expenditure of energy and for permanent maintenance personnel for frequent inspection of the freezing pipes to remove hoar-frost and ice plugs in them. Ground cooling (freezing) using ammonia-brine installations guaranteeing heat removal of up to 300 W m-2 from the pipe is the most efficient. Fig. 18.5. Air cooling installations: a - in bore holes; b - hollow piles. However such cooling installations are a rather expensive undertaking and require regular maintenance in the course of operation. Therefore they are used only in a few cases in hydrotechnical engineering and in mining, and to eliminate accidental damage to structures caused by permafrost thawing, and for preliminary foundation freezing when a reduction of the construction period is required, as well as for deep shaft sinking and tunnel driving in highly water-saturated materials. The depth of artificial ground freezing for shaft sinking achieved at present is more than 600 m.
A method of ground cooling using coolant circulation through pipes laid close to building foundations has also been adopted. The design with such a method usually includes ventilated spaces below the structure as well. Using such a complex, labour-consuming method for preservation of the frozen state of the ground is justified in construction of very sensitive structures as well as of buildings and structures with high heat release. Fig. 18.6. Constructions of the self-regulated seasonally acting cooling installations: a - liquid (Gapeyev's system);^ - vapour-liquid (Long's system); 1 - heat exchanger; 2 - coolant (kerosene); 3 - backfill; 4 - coolant (propane). lower than the ground temperature at the depth of the lower part. Under these conditions, evaporating propane (in Long's thermal piles) moves upward, condenses on the pile walls and falls to the pile base as a liquid, having a temperature the same as that of the air temperature, which then cools the surrounding ground. Liquid thermal piles work on the same principle. Cold kerosene moving downwards displaces upwards the less dense and warm kerosene thus cooling the ground. Numerous modifications of liquid and vapour-liquid cooling installations with high cooling qualities have been developed and introduced but all these structures work on the same principle. Liquid and vapour-liquid systems represent practically automatic permafrost cooling installations dispensing with the need for maintenance. They can be used independently or be installed in the body of pile foundations, therefore they are often termed thermal piles. Mean cold output of the liquid thermal piles varies in the range from 25-50 W m~2, and for the vapour-liquid ones from 60-100 W m"2. 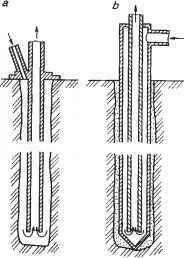 The depth of cooling achieved in practice by liquid thermal piles is 25 m and by vapour-liquid ones, 50 m. This method for cooling (freezing) can be used in conditions of discontinuous permafrost or sporadic permafrost for preconstruction ground freezing, and, using the method of permissible freezing in the course of construction and operation, for increasing the ground bearing capacity and for maintain ing the prescribed temperature of perennially frozen foundations for buildings and structures. Self-regulated cooling installations are in common use in hydrotechnical construction to create and to keep the impermeable cores of earth dams frozen, and in linear structures when erecting piers, pipelines, power transmission lines and trestles, for permafrost curtain formation, etc. One of the drawbacks of liquid and vapour-liquid thermal piles lies in the fact that in the summer period, when the thermal piles do not function, an important increase of ground temperature is noted around them. This drawback is eliminated using devices (zeroters), which accumulate cold in winter. Zeroters comprise an envelope filled with a liquid (antifreeze) freezing at temperatures below zero, which is mounted near a thermal pile. With the advent of winter the thermal pile begins to work, cooling (freezing) the ground and the antifreeze. In summer the temperature of the zeroter remains equal to the temperature of the melting antifreeze, i.e. it remains negative providing the prescribed bearing capacity of the base. Such a method is widely used in foundation engineering in the permafrost zone when construction on the second principle is performed. The methods of permafrost thawing are of two kinds: using natural heat and using artificial heat sources. The methods using natural heat are employed when enough time is available. The field of their application is limited mainly to southern zones of the permafrost regions with high mean annual ground temperature. To increase the depth of seasonal thawing the following measures are used: 1) snow retention (increase of thickness), that is, ground surface warmth retention in the cold period; 2) snow removal from the surface in spring to use solar radiation; 3) removal of surface vegetation and the upper layer of ground, surface blackening, or the use of transparent polyvinylchloride film; 4) drainage of the construction site; 5) arrangement of 20-30cm deep heat-collecting pools in summer to increase ground warm-up; 6) foundation pits filled with water for the winter period (if ground thawing properties are not impaired, providing, for example, the ground is sandy and rudaceous), keeping the ground unfrozen and promoting growth of the thaw basin. Other variants of natural heat use for prethawing of ground based on controlling the radiation balance are also a possibility. Experience shows that such methods are of limited application because of their inefficiency. The methods using artificial heat sources are far more productive. In addition to the methods of sprinkling and infiltration-thawing discussed above, methods of thawing with the help of cold and hot water, thawing with the help of steam, warming with alternating electric current of permafrost, and thermochemical methods of thawing are widely used. A method of thawing with water involves thawing of permafrost through boreholes into which the water is injected (Fig. 18.7a) The boreholes are spaced at intervals of 3-5 m depending on the ground percolation capacity. They are placed into the ground with the help of drilling rigs. It is advisable to use this method for ground with a percolation coefficient of more than 0.01 m day"1. This method is rather expensive, but it enables preconstruc-tion thawing to be carried out within 10-12 days to a depth of more than 10 m (up to 25 m) when the construction is on rudaceous soils, especially in warm permafrost. Thawing by steam is performed with the help of steam injectors (see Fig. 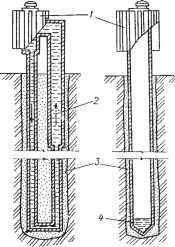 18.7b), by the open method (when the steam is released at the end of a pipe into ground) and by the closed method (when the steam is circulating within the pipe). In practice the open method is used more often. Steam injectors are sunk into the ground by gravity or are forced slightly by hammering. The use of steam makes it possible to thaw the frozen ground to a depth of 10 m.
Electrical thawing of the permafrost is the most industrial method and is used for any ground, when suitable power sources are available. The technology of thawing using electrical heating is based on the Joule-Lenz law. There are two ways of using the equipment: as electrodes and as electric heaters. In the first case alternating three-phase current at 380 V is used. The electrodes in the form of special steel probes are installed at a given depth and arranged in parallel rows spaced at 2-2.5 m (see Fig. 18.7c). The method is advisable mainly for clay-rich soil. The expenditure of energy ranges from 60-80 kW m ~3. In the second case electrolytic or resistance heaters are used to warm up the ground (see Fig. 18.7d,e). The power supply to the electric heaters is alternating current at 20-30 V. Electrolytic heaters are usually arranged in a grid pattern 3 x 2m in size, while the resistance ones are arranged in a 6 x 5 m grid pattern. The most efficient is the combined use of the equipment: as electric heaters (electrolytic and resistance) at the initial stage of thawing and then as electrodes using alternating current of high voltage. Combination of these two methods makes it possible to increase the rate of thawing of the permafrost. The thermochemical method of permafrost thawing consists of using thermochemical reactions as heat sources. Thermit, a humidified quicklime is used for these purposes. Temperatures of up to a few hundred degrees are developed as a result of slaking, causing thawing of the frozen ground. In addition, the quicklime increases in volume sharply when slaked resulting in the consolidation of the thawing ground. 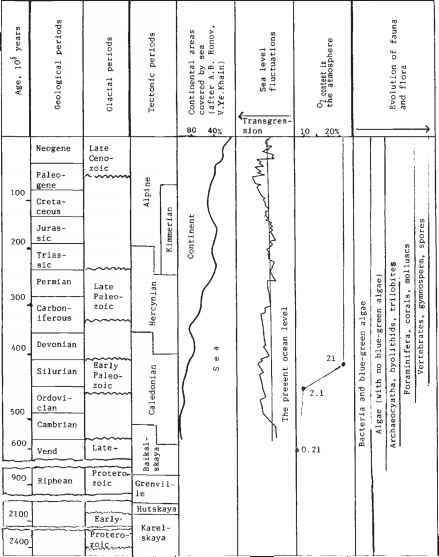 3 - bore hole); 1-3 - ground (1 - gravel-pebble, 2 - sandy-silty, 3 - sandy-silty-clay); 4 - permafrost boundary. The methods used for these purposes are identical with those for unfrozen ground. Let us enumerate the main ones. Mechanical densification is performed with the help of tamping, vibratory compaction and sometimes surface active agents are added to the ground. Tamping is used for damp ground (if the degree of water saturation is less than 0.7%). Clay-rich ground is compacted to a depth of 1.5-2 m by tamping. With vibratory methods clay-rich ground is densified to 10 m depth. Consolidation by loading, dewatering with the help of ground water table lowering, etc. are physical methods. The most efficient method for clay-rich ground is vertical sand drains which accelerates consolidation several tens of times. Vertical drainage is carried out with special sand drains of diameter 40-50 cm placed 2-3 m apart, which consist of bore holes filled with sand. The method of ground consolidation using lowering of the groundwater table is based on the increase of ground weight in the course of the temporary lowering of the water table. Chemical consolidation and strengthening of soils is performed by inject ing chemical solutions into the ground, with these solutions forming a firm foundation in the course of solidification. Chemical methods are suitable for rather water-permeable ground. The electrochemical (physico-chemical) method consists of electro-osmotic dewatering. In the course of electro-osmosis in saturated colloidal clay-rich and fine soils, pore water movement towards the cathode is initiated and the effective pressure on the ground skeleton near the anode increases, contributing, on the one hand, to ground dewatering and on the other, to consolidation of its skeleton. The method is used in fine-grained soils. Electro-osmotic consolidation is carried out with direct current. The consolidated ground mass has a few electrode loops (Fig. 18.8). Electrodes of the exterior loop are cathodes and of the interior, anodes. 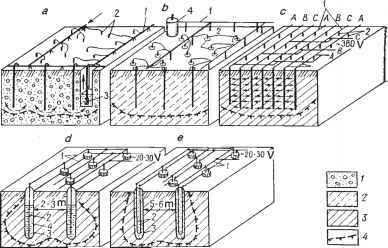 Electrodes serve as vertical drains simultaneously. Chemical admixtures such as saturated solution of quicklime with 7% calcium chloride content are required for uniform ground stabilization by electro-osmosis. This method is often used simultaneously with the use of strengthening agents, for example, with waterglass injection. Electro-osmotic dewatering is used as a rule following ground electro-thawing with the help of the same electrodes but with a modified loop. Protection of the thawed ground layer against seasonal freezing This measure is an important part of ground amelioration, because excavation of the thawing and thawed ground, and construction, are seldom completed during one season. Deep winter freezing causes additional expenditure on thawing the seasonally frozen layer and reduces the time for work, after the extended ground thawing. To decrease the depth of freezing or to exclude freezing, such measures as artificially increasing snow thickness, provision of heat-insulating covers, flooding with water, etc. are carried out. Local materials such as moss, pine needles, sawdust or artificial synthetic heat insulators such as foam plastic, polystyrene can be used as heat-insulating covers. Complete protection of the ground against seasonal freezing is achieved by flooding the areas with water to a depth somewhat greater than the depth of freezing in natural water bodies.